GYPSY IS NOW OFFICALLY RETIRED FROM THE SHOW-RING AND HAS TAKEN A GREAT LIKING TO SLEEPING ON MY BED. WHAT CAN'T I SAY ABOUT SUCH A BEAUTIFUL GIRL WHO ALWAYS GAVE ME 100% IN THE RING. GYPSY HAS NOTHING TO PROVE AS SHE WAS MADE A GRAND CHAMPION AT THE AGE OF 2 YEARS OLD AND DID IT ON HER OWN MERITS. Gypsy spotted Dad taking her photo at Sydney Royal. Gypsy wins Runner-Up Best In Show at The Asian Breeds of NSW. Gypsy is a outstanding girl, who has acheived Best In Group And Runner-Up In Group at the age of 7 months, and 7 Minor In Show's. Now Gypsy is in Puppy, she has already had 7 Puppy In Groups and 1 Puppy in show. Gypsy is now in Australian Bred, and went well under international Judges from Japan and South Africa, getting Best of Breed both days and winning Australian Bred in Group. Gypsy is now sitting on over 200 points at 10 months old, waiting to turn 1 so she can become an Australian Champion, and then to Grand Champion. Gypsy has a wonderful future in front of her in the show ring. Gypsy is now a Australian Champion. 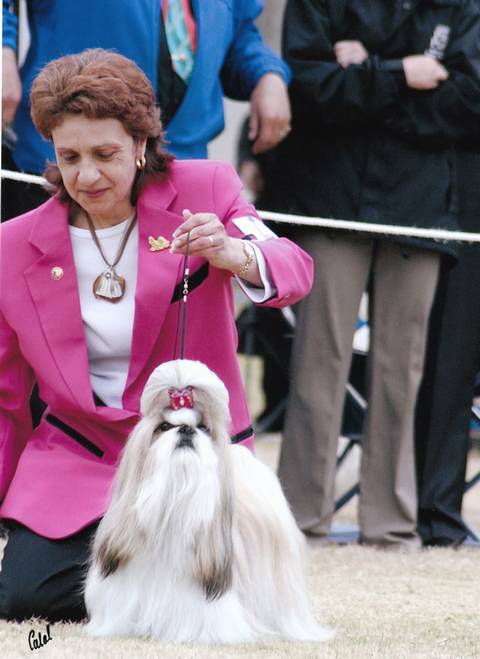 Gypsy wins Best in Show at November 06, Shih Tzu Specialty at the age of 14 months old. Gypsy is half way towards her Grand Champion. beating a good line up of dogs and including imported dog. Gypsy get's picked in TOP 8 IN NON SPORTING GROUP AT SYDNEY ROYAL. 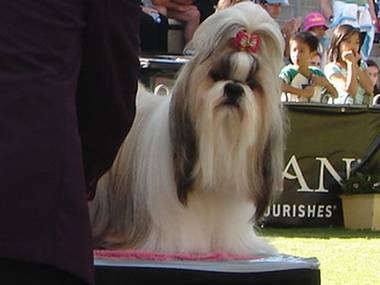 GYPSY WINS RUNNER-UP IN SHOW AT THE ASIAN BREEDS OF NSW. 3/06/07. GYPSY WINS BEST IN GROUP AND INTERMEDIATE IN SHOW AT ACT CANINE ASSOCIATION. (THANK YOU TO ALL THE JUDGES WHO HAVE GAVE GYPSY HER AWARDS). 8/06/07. GYPSY WINS BEST IN GROUP AT WOLLONDILLY ALL BREEDS KENNEL CLUB. 10/06/07. GYPSY WINS RUNNER-UP BEST IN SHOW AT COOLAMON GANMAIN KENNEL CLUB. 30/09/07. GYPSY WINS RUNNER-UP BEST IN GROUP AT WAGGA WAGGA SHOW SOCIETY. 5/10/07.